The Bowland Replacement Crew arrived at North Pickenham during May of '44. Tosi was assigned to them, as the Crew came in one man short. After they went through some in-house training they were assigned to the 856th BS on 5 Jun 44. We don't know which of the missing crews they replaced. On 12 Jun 44, they began flying combat missions. By our count they flew 3 missions as a crew. Then they were pretty much wiped out while they had a day off from combat. They had the day off on 20 Jun 44. Many of the crews within the 856th BS were short-handed that day for a variety of reasons such as illness, injuries, wounds, etc. The members of the Bowland Crew volunteered to fill in. Five of them, on five different crews didn't return from the mission. With half of the crew missing in action, it was decided to disband the Bowland Crew rather than rebuild it. The remaining five were reassigned to other crews or placed in the orphans pool. Bowland, the pilot, was reassigned to the Velarde Crew 615. Their original co-pliot, Powers, was promoted to pilot and took command of the Graham Crew 614. Miller was also reassigned to the Velarde Crew 615. What we don't know is if he joined them at the same time Bowland did. Albers, the Crew's engineer, spent about a month in the orphans pool before getting assigned to the Hamilton Crew 604. As a crew, the Hamilton Crew finished their 30 mission tour before the Group was disbanded. Their replacements, like Albers, were orphaned. Albers was sent to the new 492nd at Harrington, also known as the Carpetbaggers. Today that group is often called the 801st/492nd BG. 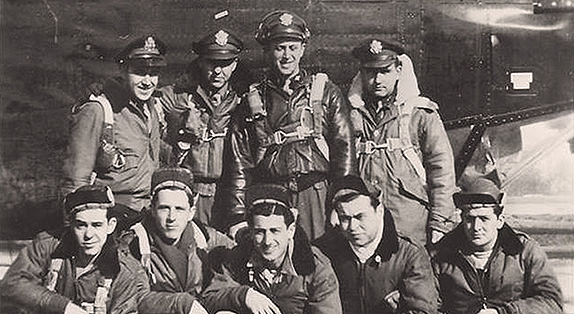 Wells was flying with the Watson Crew R-19 on 7 Jul 44 when they were shot down. We don't know if he was assigned to the crew or if he was filling in for the day. He was eventually laid to rest as part of a group burial at the Jefferson Barracks National Cemetery in St Louis, Missouri. Slater is a mystery to us. So far we haven't been able to find anything to say where he went. Page last modified Monday, February 13, 2017.